NextGen Gaming was founded in 1999 and truly lives up to its reputation as a premium gaming developer. This developer prides itself on innovation and giving its players a more personal gaming experience, which is why they have such a dedicated fan base. NextGen’s free-to-play Facebook site is award-winning, further proving that this company is dedicated to adaptability and versatility by giving their players the gameplay that they want and to an exceptionally high standard. If you want to play online slot games then look no further than NextGen. 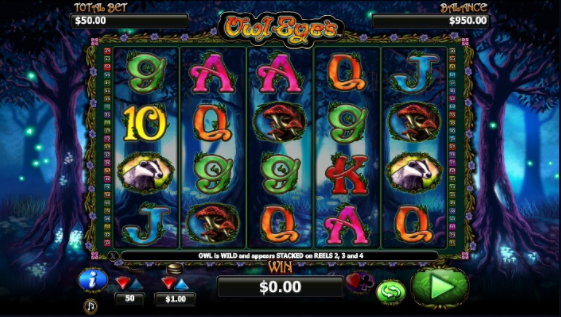 Owl Eyes is one of NextGen’s most popular games, this beautiful slot game is set deep in a fantasy inspired forest, illuminated with blue light and mysterious orbs. This enchanting slot game also offers players the chance to win some big jackpots, combine that offering with a visually stunning theme and it’s easy to understand why this slot game has become so popular. You have 5 reels and 50 pay lines to enjoy, you can start your bet from as little as 1p up to a maximum of £100 per spin. With such a big betting range, this game will appeal to every type of gambler. Decorating the reels are your traditional card playing symbols which form the lower value symbols in the game. You also have a Badger, a Tree and Mushroom symbols which form the higher value symbols, but it’s the bonus symbols that you want to watch out for. The first is the Owl Wild symbol, you can’t miss it, it’s the big owl face. It will substitute for all other symbols bar the Scatter to help you form winning combinations. The bright Full Moon symbol is the Scatter symbol, and this will help you trigger the Free Spins feature. 3 or more Scatter symbols anywhere on the reels will trigger 5 Free Spins, during this game feature your Wilds will become stacked and you can retrigger more free spins which can result in some impressive winnings. There is also the Gamble Feature available in Owl Eyes online slot. You can play this feature after any winning spin. You will have the opportunity to double or quadruple your last winning spin. Click the Gamble button and you will be dealt a card, you then need to guess if the card is black or red to double your winnings. You could take a further gamble and try to guess what suit the card is, if you guess right your winnings will be quadrupled! This is a game of chance, so if you guess incorrectly you will forfeit the bet. 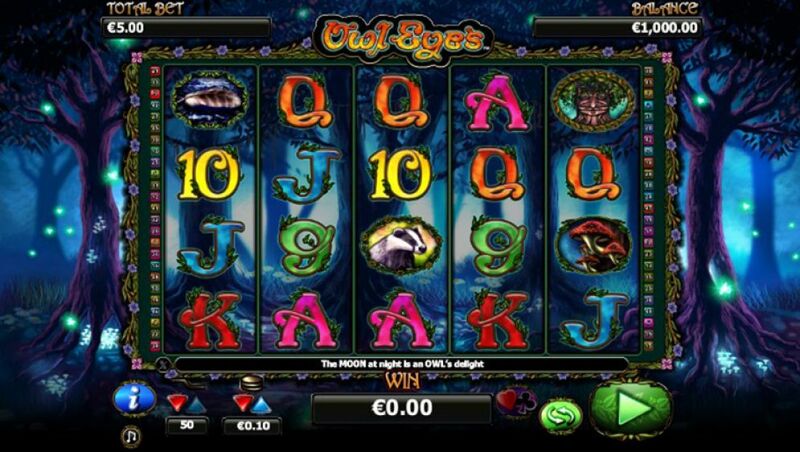 Owl Eyes is an enchanting online slot game, set in an atmospheric forest that is beautifully designed and animated. You can just sense that there are lots of hidden wonders to behold when you start to spin the reels. Not only are the graphics superb but you have some great bonus features, Wilds and Scatters that will help you win the jackpot and other cash prizes. Owl Eyes is a hoot! You’ll see why this game is so popular amongst its players. Now try our Santas Workshop slot.